UPDATE 5/30/12 - A meeting has been scheduled in the next week with Councilmember Jasso, the developer and the Lake Cliff Neighborhood Association. The developer says the space is too small for his needs and must be demolished. He will work with the neighborhood to create something similar in style. Ironically, he will also seek "Gateway" zoning decreasing setbacks from the street. Granting him these changes allows a greater footprint and in effect a larger structure, making demolition more likely and profitable. A 15 foot setback is currently required on Beckley and Zang. Preservation should be part of any deal on set back variances. If you would like a different outcome like for instance that the developer use the existing historic facade along with new constrcution - EXPRESS YOURSELF! Write your councilperson today. Humble Oil was founded in Texas in 1911. Their stations were once found throughout the state. They later merged with Standard Oil and were re-branded as Exxon in 1972. It took the Humble Oil Company almost 6 months to gain permission to build their art deco service station at the corner of Zang and Beckley. Likewise it will be the law if the Humble Service Station’s new owner demolishes the property in the near future to make way for the Payless Beer and Wine Store on the same corner. The station is not protected and an Oncor representative was on the property cutting the power lines on April 27th, 2012 and said it was only a matter of time. The Humble Station is not only unique in its architecture and style but also in its location, it rests directly across the street from the Oswald Rooming House in the Lake Cliff Historic District. The Oak Cliff Gateway Committee said at a recent public meeting they were rezoning the Oswald House so that it might be a museum one day. That seems much less likely if this happens. The recent success of the Zang Triangle with Spiral Diner, Jonathon’s and Campo has the area on a very positive path but it is a fragile one. Councilwoman Delia Jasso has promised a meeting with the developer and we will keep you posted as soon as we hear anything. 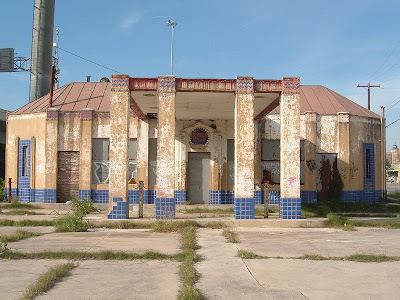 San Antonio claims their almost identical station is the last remaining Humble Service Station in the state of Texas and they may very soon be correct.